Summary: Call Brook Ogden a matchmaker-in-reverse. Let others bring people together; Brook, licensed mental health counselor, picks up the pieces after things come apart. When her own therapy practice collapses, she maintains perfect control: landing on her feet with a weekly advice-to-the-lovelorn column and a successful consulting service as the Breakup Doctor: on call to help you shape up after you breakup. I've always thought that the most powerful sort of books are the ones that you self identify with. The ones that kind of hit that chord within you and make you stop and think that you really understand the character that you're reading about. 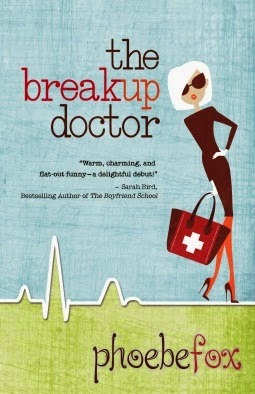 That's the sort of book that The Breakup Doctor is. When we start off the book and meet Brook for the first time, she's trying to get her feet back underneath her. She's had a bad breakup and then she abruptly loses her practice where she's been counselling, and because of said bad breakup, her finances aren't so good, either. Her new relationship is a bit tenuous and things just feel a little bit wobbly. It seems like things are looking up, though! She's the sort of person who's smooth and steady on the outside, who always seems to know what she's doing. Other people have referred to her as cold, but in spite of that many turn to her for advice - maybe that's why she's so good at her job. She might not be an official psychologist but she's good at counselling others. That's what her best friend Sasha tells her - someone who she has gotten through many a breakup - and it's through the help of her friend that she lands a weekly article, and starts picking up a client list, too. Suddenly it looks like things are turning around. We all know that life just isn't that easy, though... Unfortunately. Things only go smoothly for awhile before Brook's life is thrown into chaos again, though - family problems and relationship problems... Suddenly she's not so cool and levelheaded, and in spite of her repeated protestations, maybe she's not so 'fine' after all. I'm going to be honest, this book is the sort that may just make you cringe out of secondhand embarrassment. Brook's always felt as though she has it all together, as though she's the calm, sensible levelheaded one, but her story is very much one of what it's like to lose your grip on all of that - to fall apart completely, and then have to put yourself back together. It's a bumpy ride through emotions and stormy situations, bad decisions, and I don't know about other readers, but it felt all too familiar for me. It's a story about those judgements we make without really thinking about it, even if the person we're thinking about is a best friend, or family member. It's about the way we think about ourselves when we screw up and do something we regret because emotions have got the best of us. The book is definitely a journey, and it takes us through denial, self recrimination and shame. But it also touches on laughter, friendship, love and healing. It did make me uncomfortable a couple of times, mostly because it struck too close to home - Brook made me wince with the way she thought and acted sometimes, and I wouln't be surprised if some readers have trouble with that. Second hand embarrassment can be a powerful thing! I can't decide what to think about the structure - part of me would have liked to feel as though the arc of the plot was a bit more even, with a more gradual denouement, but a part of me also recognises that stories don't always need to have neat and tidy endings.